Secret Paradise - Paradise Retreat! 4 bdrm w / large private (Heat-able) pool! Brand new beach house with your own private pool ( heat-able for $245 chg ) backyard & private beach just 1500 feet away. Split bdrm design offers 2 king bdrms with complete privacy for 2 couples or is perfect for 2 families (2 additional bdrms for the kids). Large open great room with vaulted ceilings. Why stay in a cramped condo and share a pool with strangers when you can have the privacy and convenience of your own home! All new furniture, fully equipped kitchen, separate utility room with full size W/D, Gas Grill, 2 car garage with key pad entry so everyone can come and go without keys. Great Room has 40 inch LCD HDTV, DVD,stereo CD shelf system. For children's safety, house has alarms on all doors and windows leading to pool deck. House is approximately 2 blocks from private beach access, shown in picture. You can walk to our beach access or drive 0.3 mile east to public parking near Pompano Joe's. 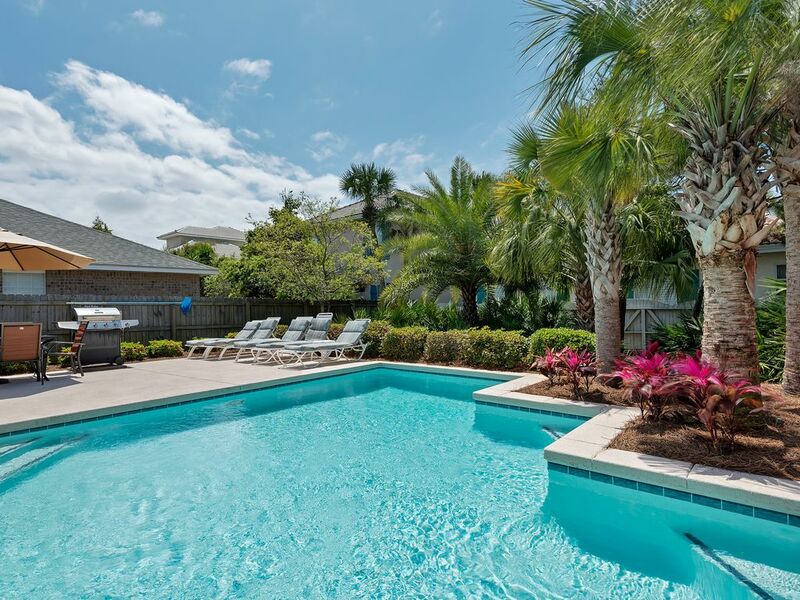 Close to all Destin has to offer, 5 min from Silver Sands Outlet Mall, and 5 min from Destin Commons. More great shopping can be found ....: Destin Commons outdoor mall. Enjoy such great stores as Abercrombie & Fitch, Ann Taylor Loft, Banana Republic, Belk, Books-A-Million & Maui Nix Surf Shop to rattle off a few. Stop for a bite to eat at the Hard Rock Café, Panera Bread, Tony’s Ristorante or Sushi Siam. More than just shopping the Destin Commons Center Plaza offers a soft-play kids playground and a 49-head pop fountain. Community activities and entertainment are held through the year at Destin Commons . Rave Motion Pictures is also housed at Destin Commons to catch the latest releases. Grande Boulevard offers stores such as Billabong, Brooks Brothers Country Club, Coldwater Creek, J. Crew-at-the-beach, Sunglass Hut, & Tommy Bahama's Emporium as well as great dining at Tommy Bahama’s , Fleming’s, and more! 40 in tv in living room and each bedroom also has a flat screen tv. We provide a start up only of paper towels toilet paper, soaps etc. This home was very clean and spacious. The pool was perfect for our kids. The beach is a short distance away but we were able to park at the public parking area or walk to our private entrance. The owners were very quick to respond to us when we needed something. We would recommend this property to anyone. Thank you for taking the time to write a review! I am so pleased that you enjoyed your stay. I hope you will come back again soon! We had a wonderful stay! Everything we could ever want/need was provided. Beautifully decorated. Great location close to beach, restaurants and shopping, etc. We will definitely return! Thank you for making our vacation special! Thank you for the lovely review! I hope you will come back again soon!!!!! I am so pleased that you enjoyed your stay! Thank you for submitting this lovely review! I hope you will come back to visit us again soon!!! Paradise retreat is a beautiful home that had everything we needed to have an amazing trip to Destin. We enjoyed mornings at the pool and days at the beach. Close to lots of fun things to do in Destin. I am so pleased that you enjoyed your stay! Thank you for this lovely review as well!! I hope you will come back again soon!